I’m in awe – with everything else you do – you’ve created these glorious spaces of luxuriant growth and colour. It’s really most impressive. As opposed to our place, which I’ve taken to calling “The Meadow” but should probably call “The Prairie” because of the several acres of thigh high grass. 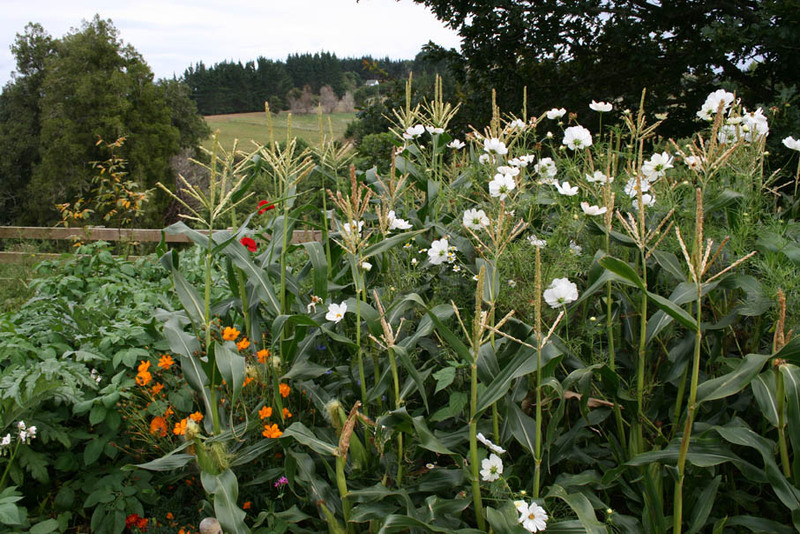 And while the bees, butterflies, weta and birds appreciate our (non) efforts, the neighbours probably don’t. It’s inspiring though to see your work. I made a lot of progress this year when I gave up trying to make it all flow beautifully from one area to another, and just planted row after row of veges or flower seedlings. I figure if you’re going to sow one row of beans, you might as well sow a whole packet. It’s easy to find homes for spare produce. I’m also very, very indebted to my husband’s cousin’s wife Nicola, who is a weeding machine! 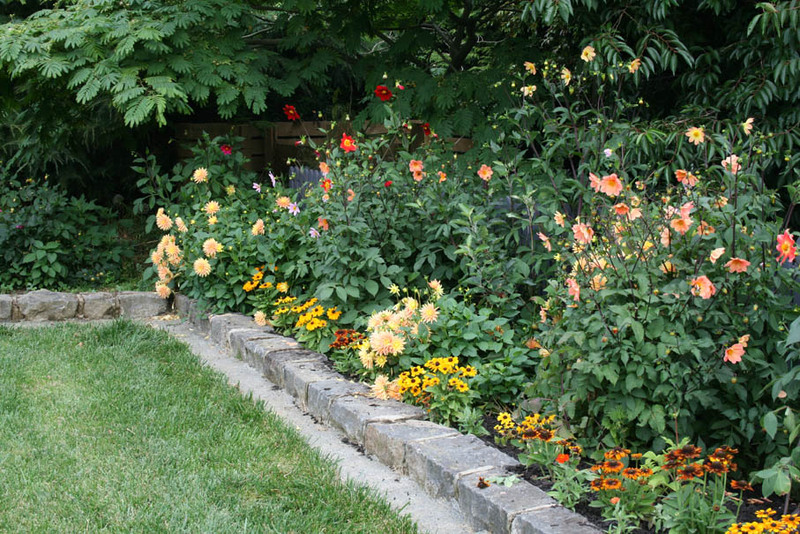 Like your garden edging, what have you used, looks like some type of brick? The edging is old kerb stones. My husband is a civil contractor and nabbed a job of disposing of a truckload of them from a construction sites. They’re pretty nice I must admit. I think finding the right edging for a garden is very difficult. English brick is great if you’ve got an old property, and concrete block is cool if you’re going for a contemporary look… but everything in between is tricky! your cavolo nero looks spectacular! Any growing tips? I love kale but my plants are quite small, not to mention covered in caterpillars. Lynda, your gardens are a credit to you. You amaze me with all you do. 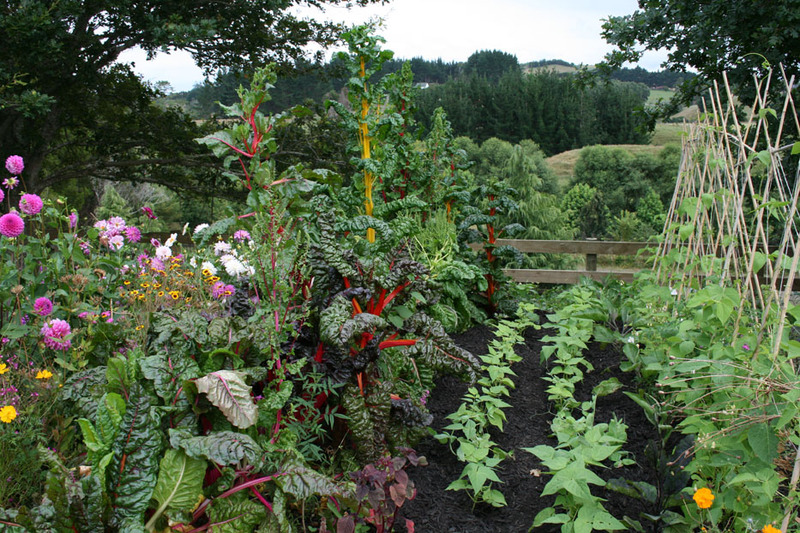 The beautiful lush growth of both your vegetable and flower gardens are a real picture. 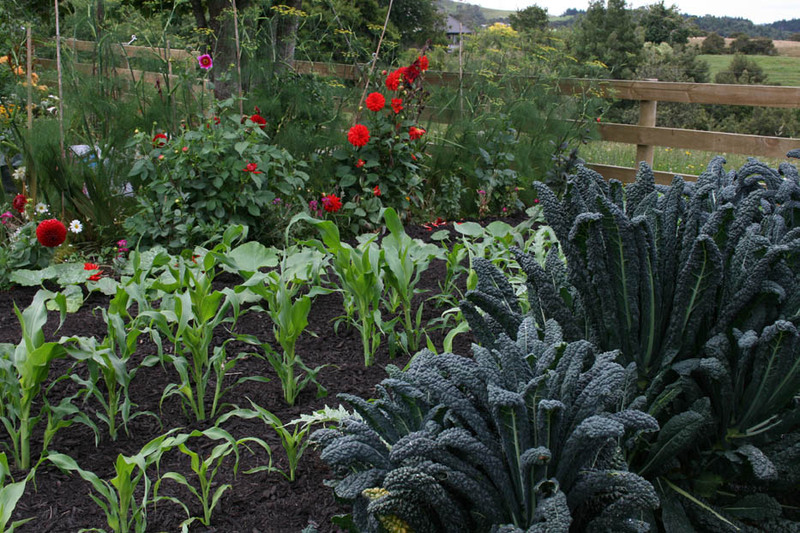 Love your Kale.— Do you grow it from seed or plants?? and where do you buy either one? as we have not seen any for sale here in Gisborne. Heard you on Kitchen and garden Show last week, at A and E Department with Lucas. Is he ok ?? Look forward to your book on roses. I am loving following your blog and reading your columns in the Gardener magazine. As a new gardener who has gone quite mad planting and pretty much obliterated my front lawn in favour of veges and flowers I am learning heaps. Mulch! okies something new for me to look into 🙂 Thanks Lynda! Stunning! What I wouldn’t give for a crop of kale like yours. Too late? Query – Have you grown rose hip, and do you think that it would do well in Auckland? I picked up an ornamental variety at my local fruit and veg shop and I quite fancy growing my own for tea, jams, jelly etc. Lynda, Speaking of Mulch, have you seen this video (not dissimilar to what you are doing but on another level? We had a transition town event in Devonport over the weekend and the two filmakers from the USA came and presented their movie (all about mulching using wood chips) http://www.backtoedenfilm.com/ The entire cinema full of patrons all set off home afterwards to go and try his methods, no crop rotation, no fertilisation (once the garden is established), no digging, no weeding… They are in NZ for a few more weeks, travelling around (but you can watch the movie for free on their website). I’d be keen to hear your thoughts on his method? (NB There is quite a religious element to his presentation, but even if you aren’t a believer (like me) there is an amazing story here. Absolutely stunning garden Lynda. I am a professional gardener of many years experience but i am still amazed by how healthy all of your plants are. It is a credit to you and the techniques that you advocate. I too have long since recognised the importance regular mulching. I love the garden edging in your last photo. Can you tell us about how that is made, or show any other good ideas? I need a mowing strip! Ours is actually stone kerbing (it came from a demolition job that my husband worked on a couple of years ago). I think it’s one of the great design challenges, finding suitable garden edging, but I like rock the best. You just need to find a source of it! Otherwise box around concrete and then polish it to reveal the aggregate – that always looks classy. Good luck! At the end of your newsletters please don’t put a fullstop after nz at the end of your email address. No such email address, ends with a fullstop. We had to investigate to find why our email to you was not sent. The fullstop was the culprit. Thank you. Thank you. No further comment as we have noticed the change.No further problem. Part of the problem was that Pam is new with computers and quite unfamiliar with email URL. Sorry to waste your time. Am absolute credit to you. A busy person manages to get everything done . I hope you sleep well when you manage to get to bed. You are proberbly still planning your next project.